The health benefits of fruits are usually not questioned -- unless the fruit is a banana. With a reputation for being too starchy or sugary, bananas have sometimes appeared on lists of foods to avoid. When they rose above that hurdle, they were suddenly labeled as promoting inflammation. While it's true that some foods can foster inflammation, bananas have a better chance of preventing inflammation than causing it. "The Inflammation-Free Diet Plan" is based on a system that rates foods according to their potential to cause inflammation. Using nutrient information, the glycemic index and other factors, foods are evaluated and given a score to illustrate their inflammatory effect on the body. Under this system, bananas received a score of -38. This categorizes them as slightly inflammatory since a score of zero is neutral and scores up to -100 are only mildly inflammatory, according to Inflammation Factor. Reports about this diet often noted that bananas were inflammatory, but other evidence points to their anti-inflammatory abilities. Even though high blood sugar can stimulate the production of substances that promote inflammation, eating one banana is not likely to spike your blood sugar. One ripe, medium-sized banana has a glycemic index score of 51, according to a report in the "American Journal of Clinical Nutrition" in 2002. Any food with a score of 55 or below is a low-glycemic food, which means it has a minimal impact on blood sugar. Over-ripe bananas often have slightly higher glycemic scores and may cause a moderate increase in blood sugar. Bananas are recommended as part of an anti-inflammatory diet to treat inflammatory bowel disease, according to a report in the January 2014 issue of the "Nutrition Journal." They're good sources of soluble fiber, which is fermented by bacteria in your large intestine. During fermentation, inflammation-fighting substances such as butyrate are produced, according to a review published in September 2014 in the "Journal of Immunology Research." 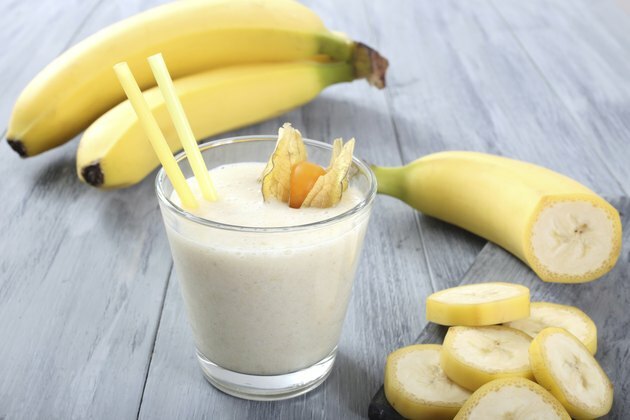 When banana fiber is fermented, it also serves as a source of fuel for bacteria, which helps them thrive. When you enjoy a banana, you gain nutrients and phytochemicals that help prevent inflammation. One medium banana has nearly the same amount of total flavonoids as a medium apple. These are antioxidants that may fight inflammation and prevent cancer, reports the Linus Pauling Institute. Consuming magnesium helps lower the risk of inflammation, according to a review in the "European Journal of Clinical Nutrition" in April 2014. One medium banana has 32 milligrams of magnesium, or 8 percent of the daily value based on a 2,000-calorie-a-day diet. Are Apples a Good Snack for Weight Loss?